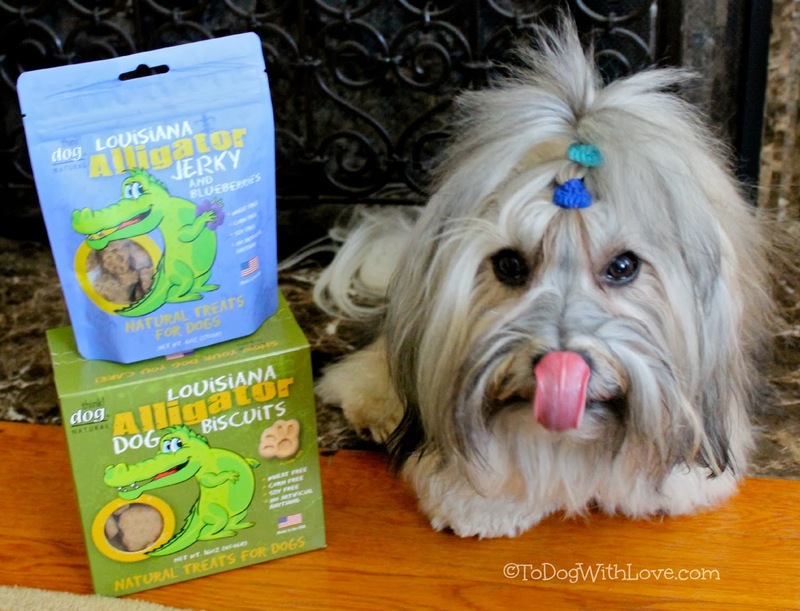 To Dog With Love: Win Louisiana Alligator Treats for Dogs! 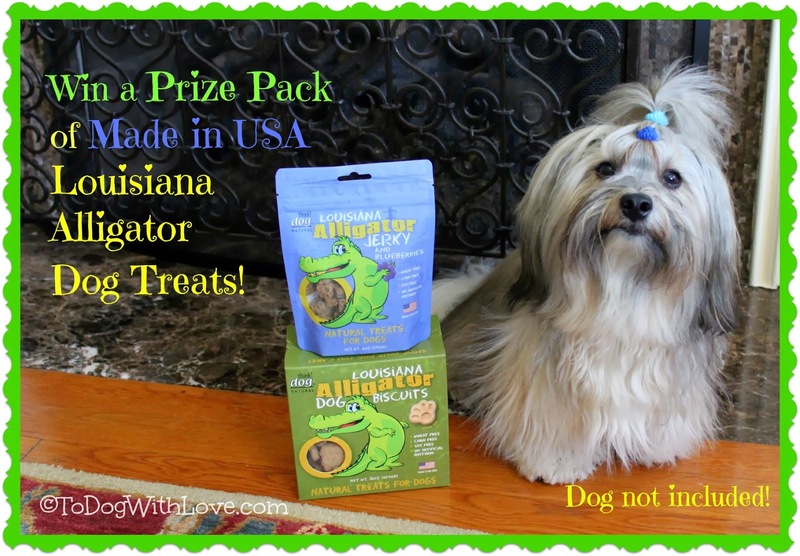 Win Louisiana Alligator Treats for Dogs! We recently learned about this new line of USA-made dog treats, and one of the cool things about them is that they're all made with alternative protein sources. So if you have a dog with allergies, or a pup who likes to try new things, these could be a great choice for you! 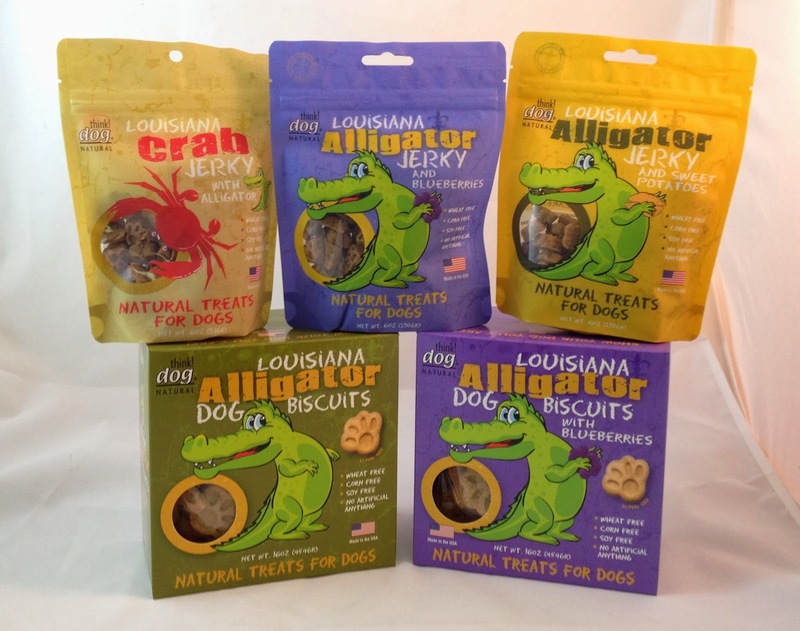 And today, here's your chance to win a whole prize pack of new think!dog Louisiana Alligator Treats for dogs. Read all the way down to enter and learn more about our prize pack! Rocco says they're lip-smacking delicious! But first, here's a few more reasons to love these new treats from Delca Corp.
We love the way the soft treats break easily into even smaller pieces (for more treating goodness!) and Rocco loves them too! Take a look! Read more about the full line of treats here, and check them out on Twitter, Facebook and Instagram too! Enter via Giveaway Tools below to win a fabulous prize pack that includes various flavors of THREE bags of Louisiana Alligator Jerky AND TWO boxes of Louisiana Alligator Biscuits! Disclosure: We were provided with Louisiana Alligator Dog Treats to review and giveaway. All opinions expressed herein are entirely our own. What fun! Tanner is drooling just thinking about Alligator. Each year we do an alligator safety post, since we live in the heart of alligator country in central Florida. Have fun, Rocco! Better to eat them than be eaten by them, we always say! Rocco says they are delicious! We have two dogs, Dot the Brittany and Taco the pit/lab mix. Dot is absolutely a princess and Taco is a silly little boy. Honey loves seafood. Sometimes I even buy her own human smoked salmon. In truth, it's cheaper than the dog brands. We'd love to win alligator dog treats. Especially seeing how they made Rocco jump. I saw these treats at a local supply store, and wondered about them. My dogs are treat critics. I have five Treeing Walker Coonhounds (one senior, who will be 13 next month, and the other four are in the 3-5 year range) who are all rescues and like most hounds love just about any treat. I'm curious to see how they would react to trying these. I have 2 dogs and 2 cats. Kota is a Husky mix and his daughter, Shunta also has border collie and shepherd in her. Shunta's mother was Kita who just passed this past August, she was a rescue border collie from the shelter. I had her for 11 years and we miss her very much. My oldest cat Mushu that I have now is almost 14 years old and Sneaky Pie is 7. They are all my best friends and companions. I have 2 spaniel mixes we adopted named Kandy and Kody. Kandy is 15 yrs old now and Kody is 14 :) I also have a cat named Shadow who was a stray that adopted us :) I'd love to see how my dogs like these! Gershwin loves to do tricks for treats! i have 4 dogs, a miniature schnauzer, a little terrier mix, and two huge pibbles along with 8 full time kitties, a feral colony i oversee and from time to time fosters that we care for on their way home. i love finding alternative proteins for my senior pibble...her skin is wonky in her old age but she loves her treats! I have a black and white cocker spaniel named Mr. Wilson. He is 10 now and is every bit the old man. He loves to chase things cats, squirrels ect..
Nina is a 5 lb Chihuahua, but she is the leader of her pack. That pack consists of 2 cats she was raised with and a 90lb Lab roommate. Not only would my 4 big rescue dogs go crazy over these treats, I think my 3 cats would too. They love all things seafood. Sissy is a cocker spaniel and corgi mix and it a better mouser than the cat! My pup Will is learning Rally Obedience and we plan on going to our first show in March. These treats sound like just the thing to motivate him. My dogs Kouga and Artie are two large mixed breed rescue dogs. I'm Ruckus the Eskie, aka American Eskimo! I'm about 30lbs! We have 2 cats and 2 dogs-the dogs need some more obedience classes! My pet loves to play catch for treats! both our dogs are rescues, and real blessings in our lives. I have a Chihuahua named Winnie, she's one. She's the most lovable dog I have ever had. Kissing is her favorite. Shiloh is a almost 4 year old Sheltie. He's high-energy and is happy to do anything, as long as we're doing it together. I have a maltipoo named Abbott who is my best friend in the world. I have three Boston Terrier's, Rozy, Junebug and Adrianne. They are my babies. We have a german shepherd and a Pomeranian and they are so great. my big baby is a mix of who knows what. She's our best girl. Big Boy is a foundling. Two years ago my oldest daughter came running into our house. "There's a giant dog in our garage!" He was half dead, barely able to walk. We fed him, watered him, and the next day he was on the porch, looking pathetic, but wagging his tail. After more food, more water, and a bath he was feeling better. We tried to find his owner, but were unable to. We think he was likely dumped near us since we posted lost dog flyers, went to all the local vets, and even did a found dog ad in the newspaper. Anyway, this big, loveable, friendly, and stinky dog is ours now. I have 2 crazy labs that live inside. They are sweet and love to get into a bit of mischief. Gracie loves these new treats!! They came in her barkbox this month. Would love to try the biscuits. My girls are Jada and Bailey. They both love new and unusual treats! my boys are murph and phinney--they're best buds! I have a mixed cocker spaniel that is 10 years old this year but has not slowed much. He love his toys and treats. Thanks for everything. I have two 90lb. dogs, so food is a good thing to win. One is a black lab who loves to water fowl. The other is a Cane Corse (Italian Mastiff) who love to cuddle. My Great Pyrenees/Border Collie dog is awesome! He is such a great protector! He also looooooves his treats! Our dog Duke is a mix of Boston Terrier and Boxer and everyone always thinks he's a puppy! We have a houseful of dogs ranging from 14 to 140 pounds. But they all love Louisiana Alligator Treats. I gave them that for a bedtime snack just last night. We have 2 goofy pugs, they make the days so much fun! I have eight dogs, yes, a house full but I love them all and can't imagine my life without them. Three of my dogs are rescues and while I didn't "need" more dogs when they came along, I couldn't say no. Two of them, a pit bull and a long hair chihuahua, came from very very bad situations in horrid condition and literally would have and almost did die....the third rescue,a Sheltie was a tug on my heart strings as he came from someone who already had two large dogs and was very pregnant with child number six, all of which were under 5, so with her plate more full than she could handle she wanted someone who understood the breed to take her ten month old puppy....I already had the breed, the rest of my dogs are shelties and had for years....she thought I was perfect and I couldn't say no....I went to petsmart with three dogs and came home with four... One of my dogs has a food sensitivity, I haven't completely narrowed it down but it's wheat corn or soy....I haven't narrowed it down and further as even a tiny bite of the offending ingredient makes her quite sick....so I just cut out anything but higher quality treats without these things and she hasn't had a problem since..... I have not yet tried alligator treats, I think my dogs would love them! Lately they have had a couple "different" protein treats such as bison and venison and duck and they go crazy for them all....so much so that I added a duck based food to their regular chicken based formula and mix it in and they LOVE it....I did the same with a venison based food last month and they love the switch up with the added flavor.... I know they would love to try these and I love that they are high quality so all my dogs can eat them and also that it's such a. Nice giveaway with multiple packages. With eight dogs, a single small bag of treats does not last long so I love that the soft ones are tiny as well! Thanks for the chance to win this awesome prize for my babies! My pets always expect some kind of treat whenever I come back home from the store, if I have bags in my hands they had better include some kind of treat for them (cats and dogs both and that even includes a pig) It is hard to find treats that I feel comfortable feeding them anymore and these alligator snacks look great! My 2 dogs are shelter dogs and are everything to us! I have a Yellow Lab named Marley who is two and a Welsh Corgi named Colby who is a year old. We also have three cats Moses, Scooter and Sebastian. My dogs love all different kinds of treats! I have a 1 eyed Jack Russell Terrier. She is the most popular dog on the block. I only have one dog at the moment, Vicki or Vix as I commonly call her. She'll be 12 in March and we've been together since she was about 6 months old. She's a "rescue mix, part Rat Terrier they believed. She's a picky, picky eater but is a sweetheart. We have 2 male bulldogs (one olde english who's 10, one mini who's 5) and our old english will pick up one of mine or my husband's shoes when he's left home alone and sleep with it in the living room. Oh yeah and they both love treats! We have 2 puppy loves! A 6 year old Silky Terrier that we adopted from an abused environment; and a 1 year old total puppy, Golden Retriever. We have a long haired mini dachshund named Little Man. Sweetest guy around! I have 4 rescued dogs and they are angels. We also have a cat who thinks he is a dog. He is a Yorkie/Black Lab mix. Crazy, I know! My dog is a corgi/beagle/jack russell mix. Love him! My dog Hercules loves to shake hands! Well deserved treat as far as I am concerned. Sweet yorkie pup. My little Terra would love these treats. She's an 11 year old Westie! We have two Shih Tzus named Princess and Hershey and a Chihuahua named Rocky.